Murals can be spotted throughout New York City, but they are not as common as they are in the City of Murals. This is the first post of a NYC mural, taken in DUMBO. 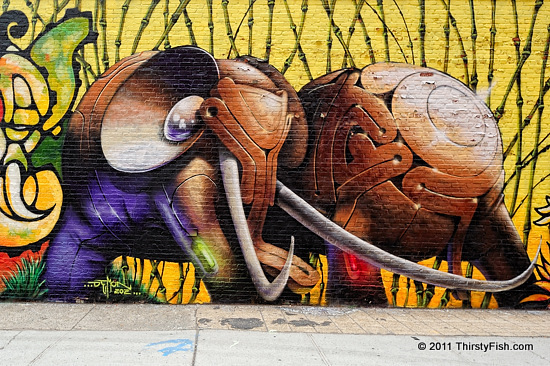 Although I could not find an official title for this mural, I came across an informative post by a DUMBO resident. The mural is a collaboration by a group called "303 Collectives". The section of the mural in the photograph is of two elephants crossing each other and it symbolizes communication. The mural is influenced by the Hindu deity Ganesha, the patron of arts and sciences, the Deva of intellect and wisdom, and most recognizably, the remover of obstacles. Ganesha is one of the easy to identify deities; he is represented with the head of an elephant. Since the 2nd Century CE, Ganesha has been a popular figure in Indian Art and iconography.